I am very, very satisfied with the job you did! I had an excellent experience from my first contact with your office staff to the completion! Your installation crew were very efficient and friendly. They kept us well informed. You did a great job - It's so nice to go down in the basement and see it so dry and clean looking. I wish I had done it years ago! Thank you for bringing your company to the Trade Fair! The staff were very friendly, informative and helpful. I do like the end result. Not damp or humid in my crawlspace anymore! "We are very pleased with our new window wells, and all aspects of dealing with this company. Thanks for a job well done." discovered the company on the internet and also checked with the Parry Sound Chamber of Commerce. Ken and Marina launched Kenmar Enterprises in 1984, providing foundation repair and damp proofing homes. 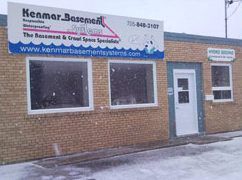 Now called Kenmar Basement Systems, their business has expanded to include state-of-the-art foundation waterproofing, and crawl space encapsulation and repair. Known as the contractor of choice for foundation repair and waterproofing in the Northern Ontario area, they responded to customer need and expanded their offices to include an additional location in Sudbury. Their philosophy is simple, we're all on the same team providing our customers with outstanding solutions and service. Owners Ken and Marina Westlake have a great understanding of basement waterproofing. They launched their business, Kenmar Enterprises, in 1984. Their services included foundation repair and damp proofing. In 2002, they moved their business into a 1,000 square foot building where they expanded their services to include foundation crack repair, carbon fiber strapping, interior dewatering and exterior weeping tiles. Always on the leading edge of technology, Kenmar Basement Systems soon became known as the contractor of choice for foundation repair and waterproofing in the area. The Kenmar team soon outgrew their premises and in 2004, moved into their 4,000 sq. foot building. The business expanded to serve the Highway 17 corridor from Sault Ste. Marie to Sudbury and south including Manitoulin Island. And in 2011 Kenmar opened a second location in Sudbury. 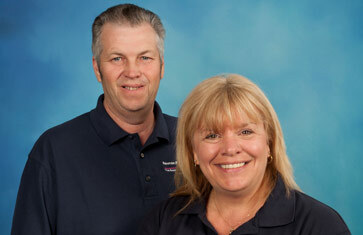 Ken and Marina are always looking to improve the products and services they provide to their customers. In 2011, the company joined the Basement Waterproofing and Crawl Space Repair Contractor Network of Basement Systems, Inc. Ken changed his company name to Kenmar Basement Systems, to reflect a premiere basement system for foundation waterproofing and crawl space encapsulation and repair.